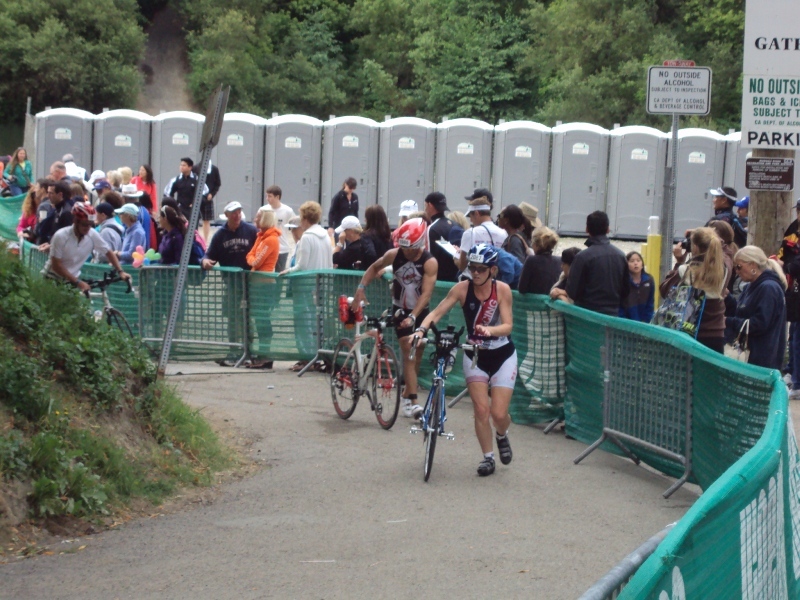 I signed up for Vineman 70.3 way back in November. I had a friend that was going to do it and I thought it would be fun to do it after Oceanside 70.3 which I had already registered for. I had no idea how far I would come by the time the race finally arrived. We stayed in a super cute place that was walking distance from the start. We went for a little ride and run the day before and scoped out the swim area. I didn’t get in the water because everybody was saying how nice it was so I wasn’t worried. The funniest part was watching people swimming in the river and standing up in the middle! I have never swam in water so shallow! 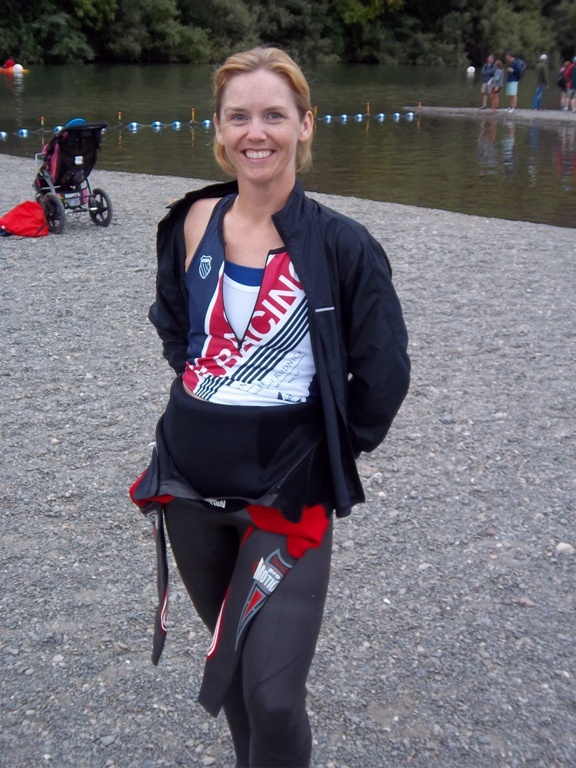 My wave start was one of the last and we were so close to the start that I actually slept in until 5:00 AM on race day! I got to the start with 2 hours until my wave! After getting all set up, watching a few of my friends exit the swim, it was finally my turn. I was lucky to actually be starting with a friend that I have been training with a little, Jenn. We are both strong swimmers so we made our way to the front of the swim start (it was an in water start, my favorite) and waited for the horn. 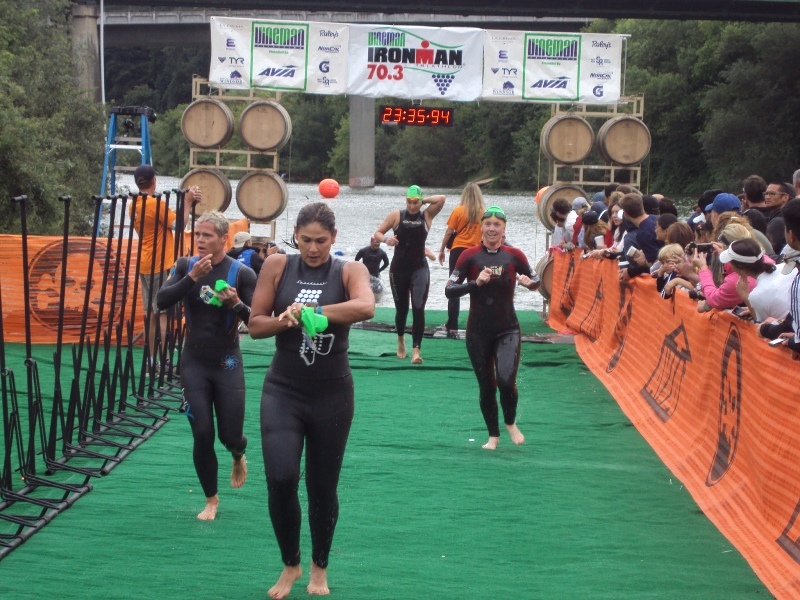 I had high hopes for the swim since I have felt pretty strong in the water lately. 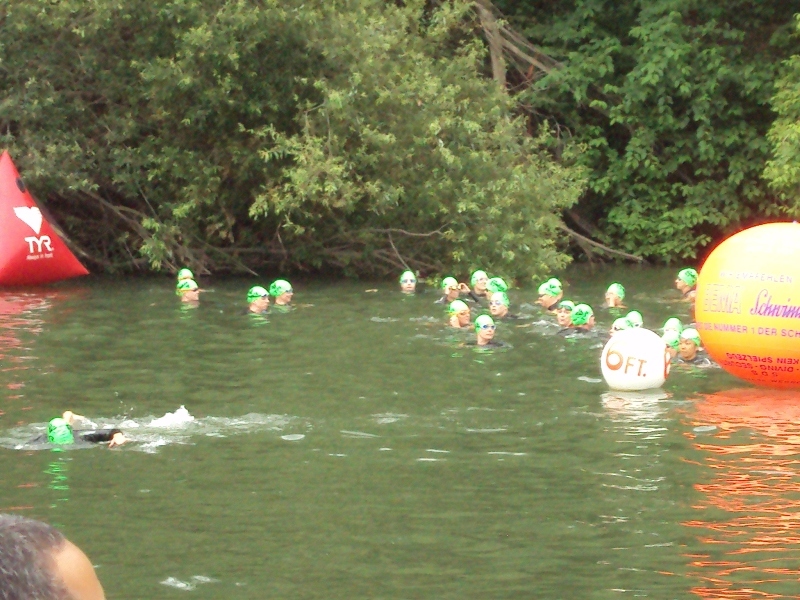 Jenn and I leapfrogged our way through the swim taking turn leading. I found it very motivating to race someone I knew in the water. She did get me by 23 seconds out of the water but we both had great swims. 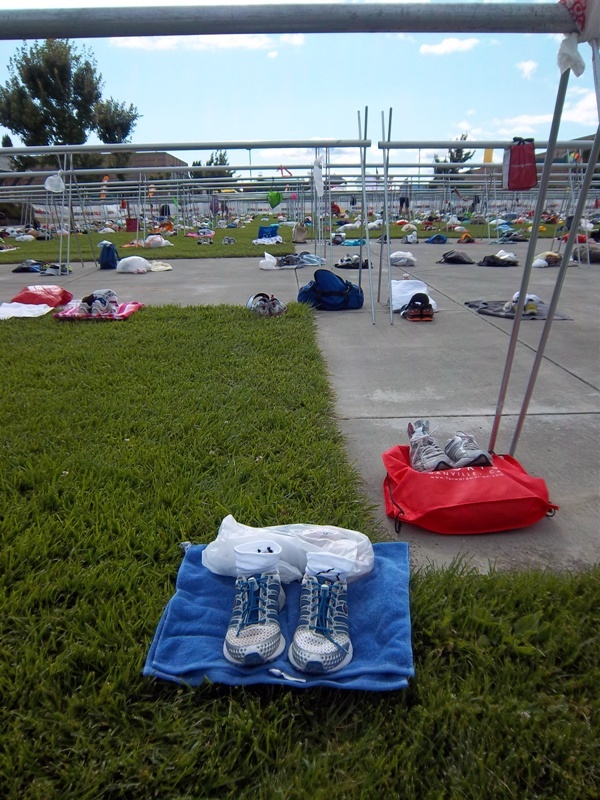 I swam 31:37 for the 1.2 miles, 12th out of the water. Open water start for our wave. I am in there, the one in the green cap! Out of the water and on my way to the bike! On my way out of T2 to the run. Still holding all my stuff! 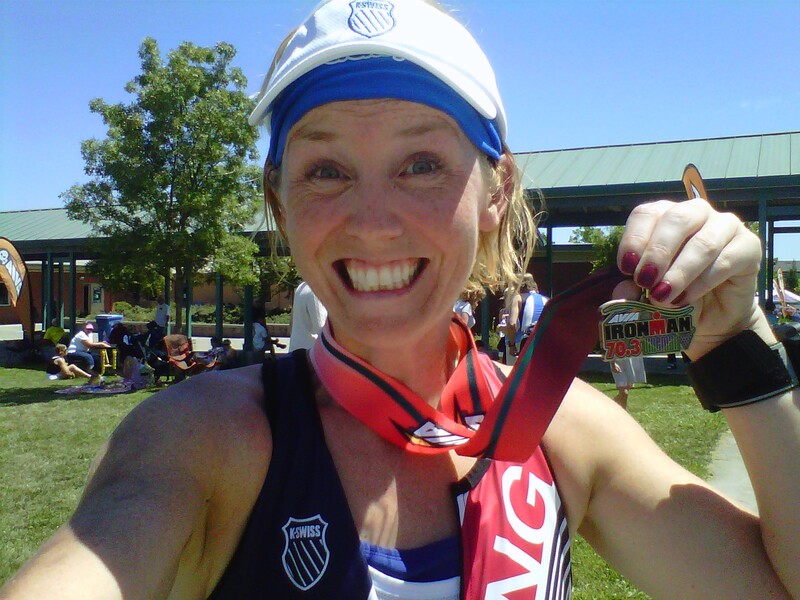 Overall I did 5:32:25 for the total 70.3 with transitions. My goal had been 5:45 (but my ultimate goal was 5:30). So needless to say I was thrilled with the end result. That time was good for 20th in my division (153 were supposed to start) and 640 overall (2300ish). Best part of it all was that I finished feeling strong. I felt in control of my race all day. That to me is the most important. Just a little bit happy after it was all over. I couldn’t have done this without the support of my friends and family. A huge thanks goes to my family. My husband and parents have been amazing on supporting my training. I could never have been this prepared without their support and help. I also need to thank my Dailymile and Twitter friends. It was awesome getting tweets and messages before and after the race. I will definitely do this race again next year. It was by far the coolest race I have ever done! EVAH! 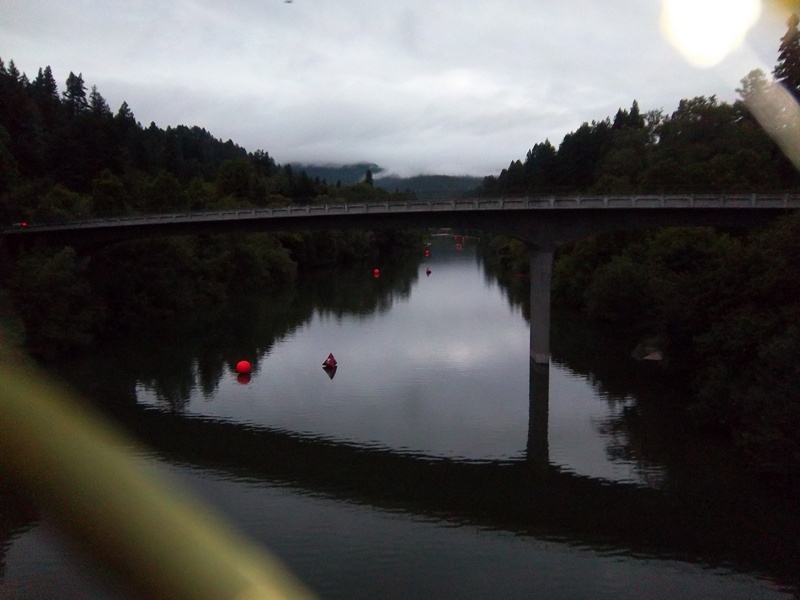 This was the swim course before the day started. It was one of the nicest swims I have ever done. On the beach waiting for my wave to start. You did awesome as well! Wow, what a terrific day you had!! Congratulations! Congrats Miss Speedy! It must feel great seeing all your hardwork continue to pay-off! It does make the training well worth it when it all comes together on race day! I know I commented already on DM but you deserve another big congrats on a well executed race. Great job!! Thanks KC. I am still on a post race high! Wow, what a great race day! I am going to have to do that one next year, too. I saw a photo gallery of the race on triathlete magazine’s website and it is just so beautiful. 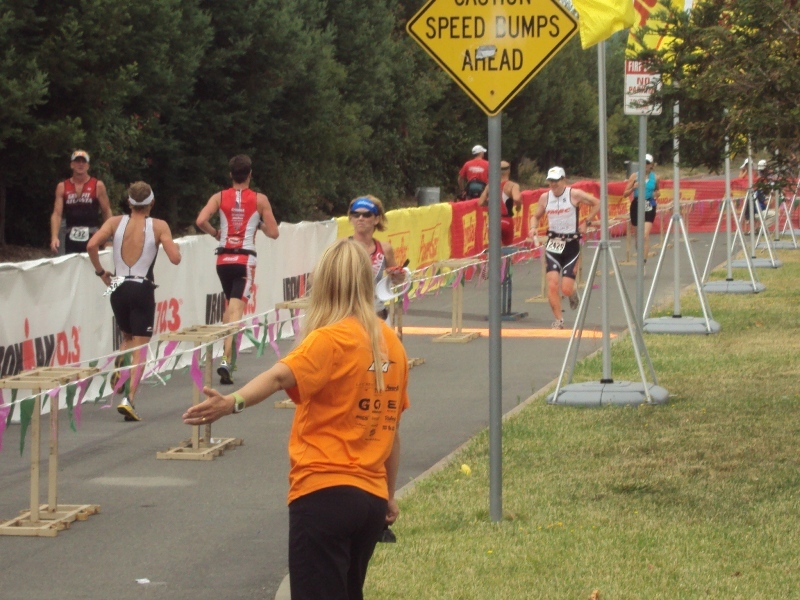 It reminds me of running the Napa Valley Marathon in March 2010, which is the most beautiful marathon I’ve done. I just love wine country. Well, you really rocked it. Congrats! It was the most beautiful race! You must sign up! I will tell you the secret place to stay as well! You rocked this race and what an improvement from IMCA. You are on a roll. Keep going strong. That sounds awesome! You aced the run! It’s a beautiful day when all the hard work comes together…Congratulations…you earned every sweaty bit of it !!! I’m so proud of you!! Thanks Jenn! It was an amazing day. I have never enjoyed 13.1 miles of running so much! That’s just too cool. Congrats to you on another great tri! I’m in awe, and bow down to you….2 70.3’s in just a few months! You’re amazing!